Starting April 2, 2012, 12:00PM EST until April 30, 2012, 11:59PM EST, upload your picture or use a model to try on the latest celebrity hair color trends, hand picked by NYC top colorist Beth Minardi. Get the scoop on how to ask your colorist for a similar hair color, and how to maintain it at home using the new Minardi Luxury Color Care product line, made specifically to care for color treated hair. 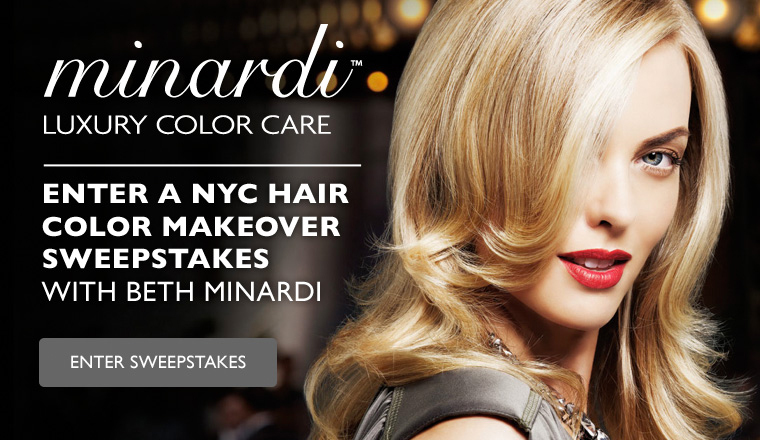 Share the Minardi Celebrity Hair Color Makeover Studio app or your makeover to enter to win the grand prize or second prize. You must be 18 years or older to enter. Limit to one entry per person, per day. Click here for full sweepstakes rules and regulations!